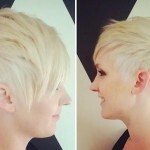 Looking for something totally original, then try this short haircut that’s full of style and fun! Starting from a short back and sides base, the top is left long to make a versatile short hairstyle with personality. It’s a young haircut that reminds me of the trendy ‘rock-a-billy’ hairdo’s featuring a swept-back quiff, copied from 50’s American haircuts for boys. It’s amazing how different style trends start off as ‘belonging’ to one group and then years later they all come together in a fresh blend. The 5-points short haircut began with Mary Quant in Sixties London, with two side-points and 3 more cut in a pattern at the nape. 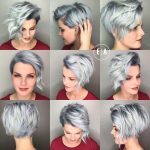 Shaved sides with lines etched into them began in black male haircuts and platinum-blonde was first in fashion in 1930’s Hollywood with original blonde-bombshell, actress Jean Harlow. Add in the ‘Gibson Girl’ pompadour quiff at the front and you have a fabulous new ‘do for 2015!